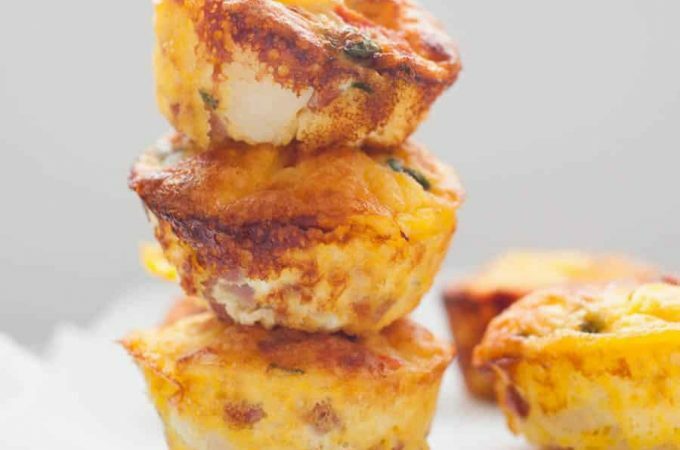 These delicious muffins are quick to make, sugar free and healthy for the whole family! 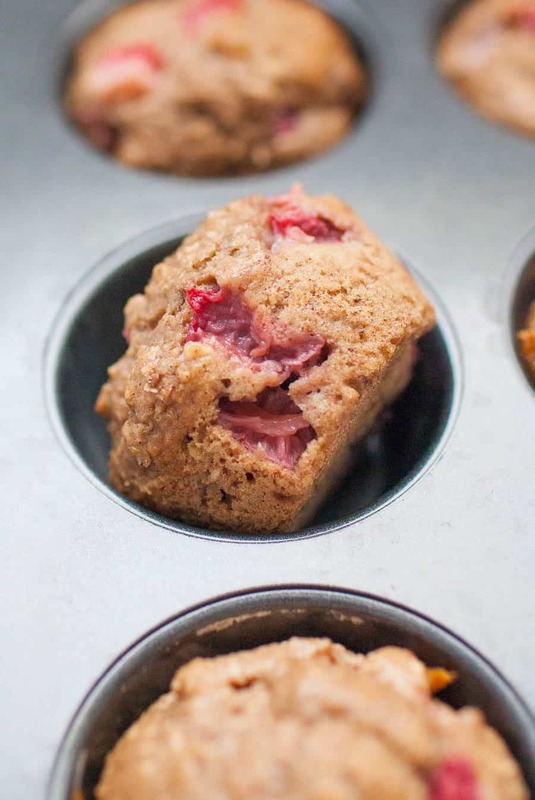 No Sugar Added Strawberry Muffins are sweetened with dates and a splash of maple syrup, but their true sweetness comes from the fresh strawberries! 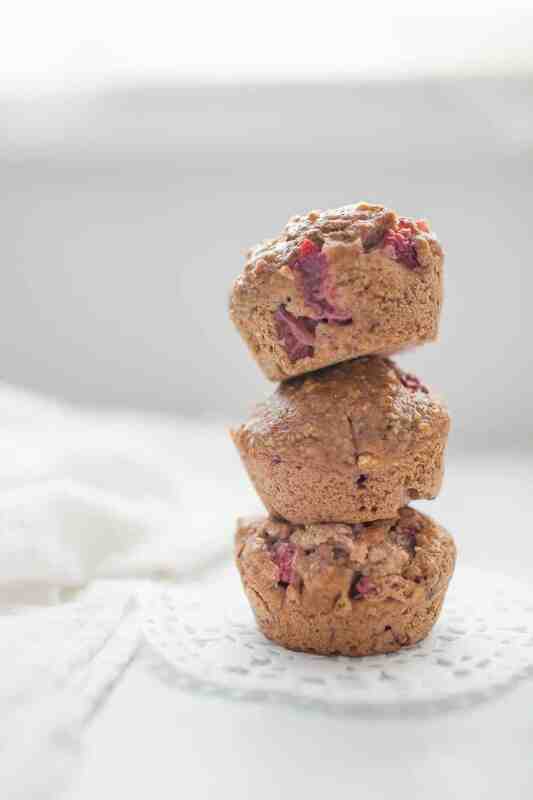 These blender muffins are the perfect before school treat or afternoon snack. As I’ve mentioned a few times before, quick breakfasts are really essential in our house. 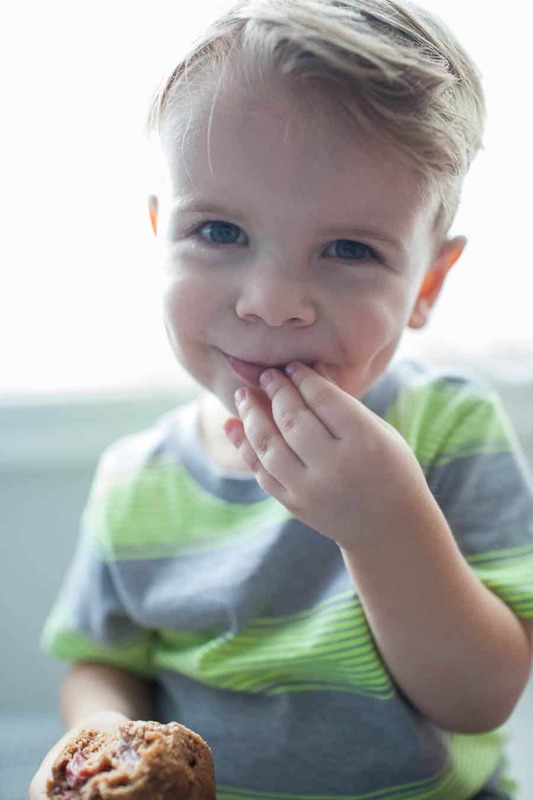 Our two year old is just like me, he wakes up basically hangry and needs food ASAP. 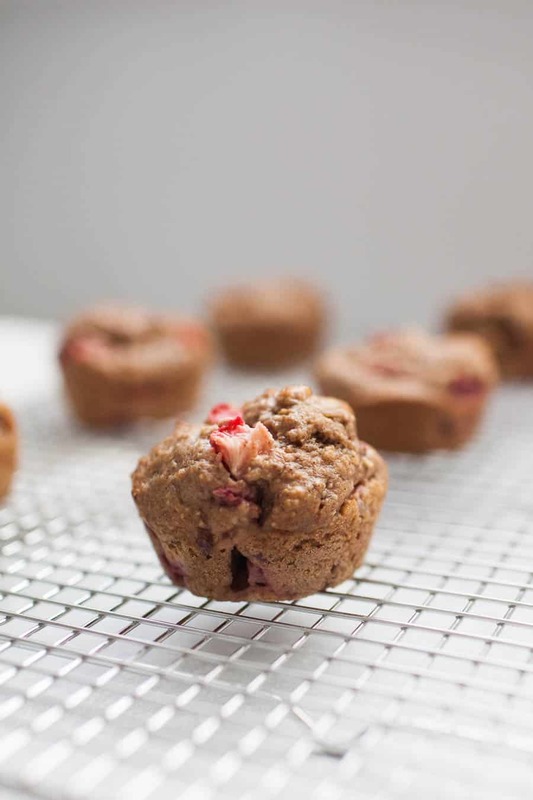 These no sugar added strawberry muffins came to the rescue a few weeks ago when I finally tried a strawberry version of my no sugar added blueberry muffins that we LOVE. These muffins are super similar to the blueberry version, but I just love, love, love strawberries so these are an easy favorite of mine between the two. Like the blueberry ones, these are refined sugar free, they are sweetened with dates and a dash of maple syrup. The maple syrup isn’t completely necessary if you want these to be sweetened with fruit only. I just love the added robust flavor that it gives these muffins! One of the things I love most about using dates in these muffins is the beautiful color that it gives them! Plus adding in some cinnamon, these muffins are just stunning (if I do say so myself). 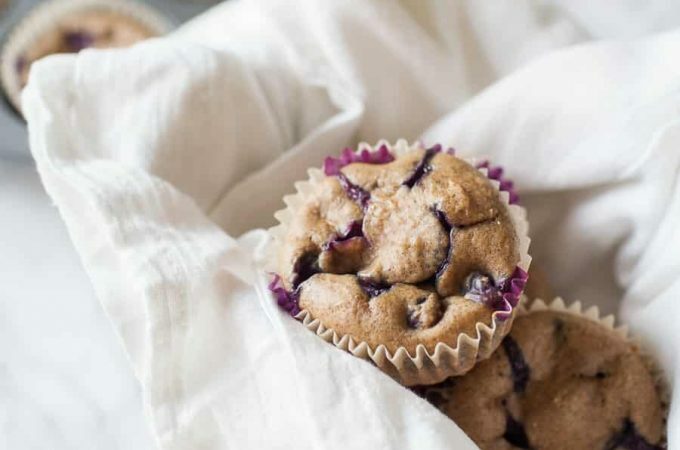 My son loves blueberries more than anything on the planet but I think he’d choose these strawberry muffins over the blueberry ones if you asked him. And hearing a two year old say “trawberry mussins” is just about the cutest thing you could hear. I have been wanting to experiment with making donuts at home and a friend of mine encouraged me to try the batter for these muffins but in a donut pan. 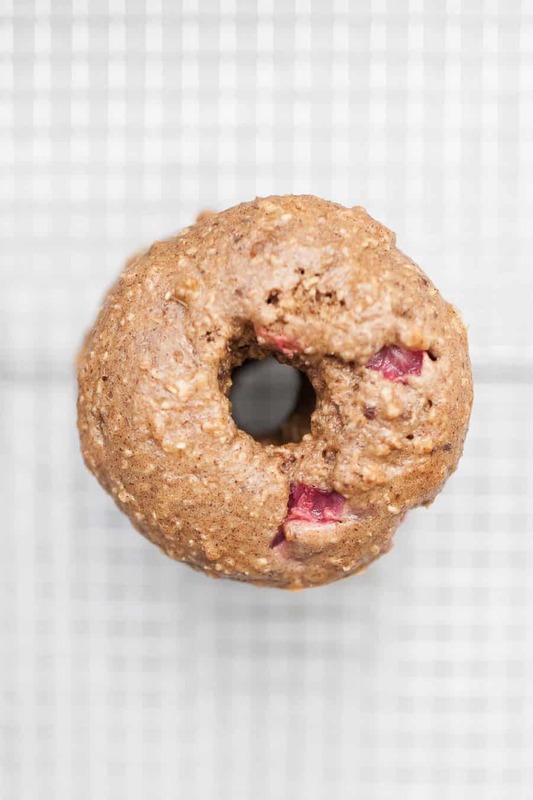 Turns out, you can pretty much put any kind of batter into a donut pan and it’s at least 50% more exciting in donut form 😉 So if you want to switch it up, you can definitely make these donut shaped too! 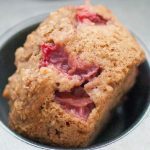 If you have a couple of kids or are making these no sugar added strawberry muffins for a crowd, you definitely will want to make a double batch. The recipe makes about 12 muffins but they only last a couple of days in our house with a family of three (and it’s really just two of us who are eating these!). Luckily they are SUPER easy to make and you can double them easily! 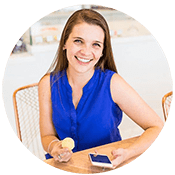 If you don’t have a blender that you like– I just upgraded our hand me down super old one– you can puree the dates and water in a food processor and then mix the remaining ingredients by hand. You will just have larger pieces of oats in your muffins, but that should only make the muffins even prettier! 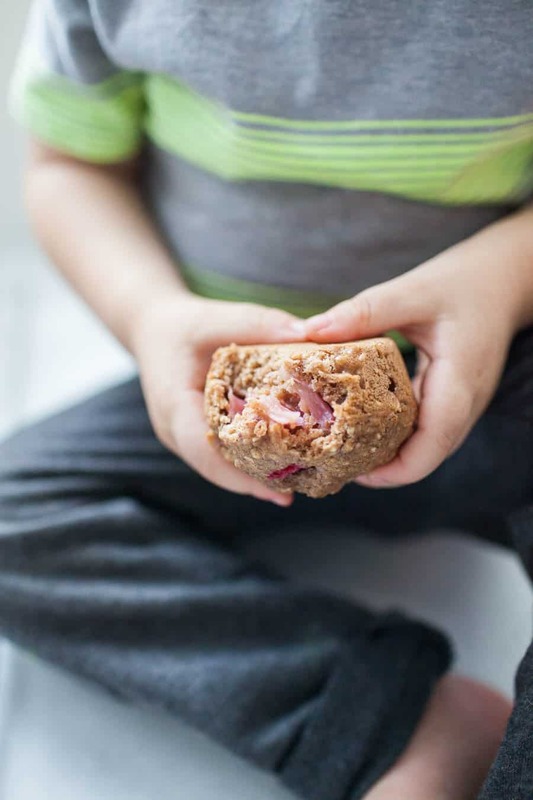 Granted he may have been smirking because he legitimately stole a muffin from my set up while I was shooting photos, but either way, I promise your kiddos will love these muffins! Start a pot of water and wait for it to boil. Place chopped dates into a blender. Then pour hot water on top of the dates. Blend until dates are pureed. 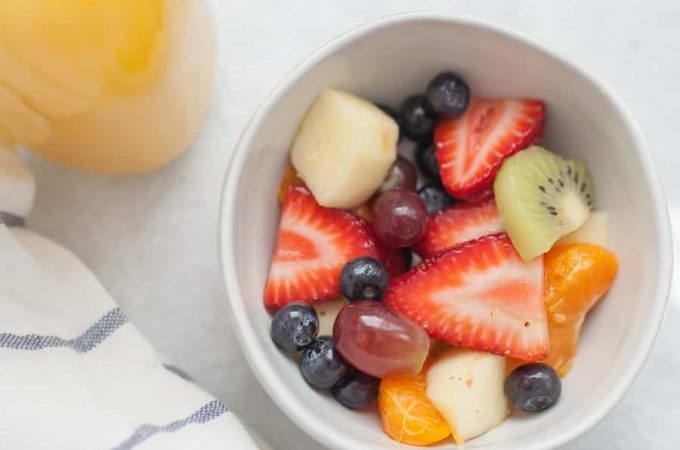 Add remaining ingredients (except strawberries) to blender, starting with the dry ingredients. Blend until ingredients are mixed and oats are ground. Gently fold in strawberries with a silicone spatula. Pour directly into a greased muffin pan, about 3/4 full. Bake for 20-25 minutes, until the center of the muffins bounce back when poked. Allow to cool for two minutes in muffin tin before moving to a wire cooling rack. You can substitute all purpose flour for the bread flour if you don’t have any available. Bread flour just makes the muffins a tad bit fluffier! For donuts, use a donut pan and bake for 12-15 minutes or until donuts spring back when gently touched. I love strawberries! I can’t wait to try making these. William will love them too! 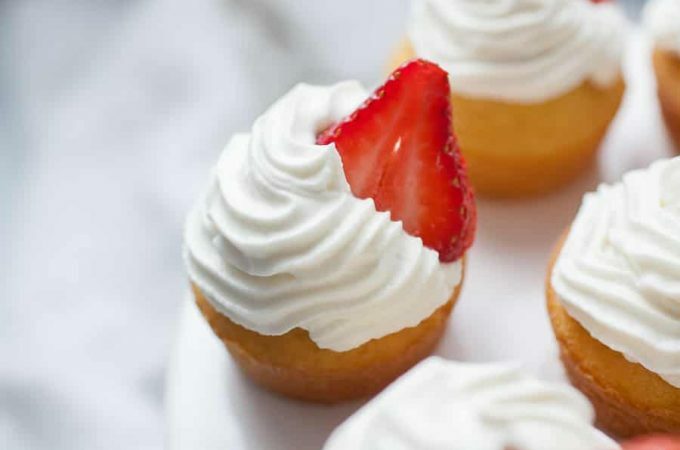 I just made these with apples (trying with strawberries next!) and they’re delicious! I can’t wait to give the toddler some for breakfast tomorrow. So glad to find healthier version ! Thank you so much ! You are so welcome! I hope you enjoy them. We honestly make these on a weekly basis!